To Plagiarize, "Research" or "Shade Your Eyes"? There has been much discussion today of plagiarism in the context of the Canadian election, with accusations reported around the world of plagiarism of Australia's former Prime Minister John Howard concerning the war in Iraq in a 2003 speech in Canada's Parliament. There have even been suggestion that the impugned wording, or at least the "talking points", came directly from Washington, which would at least obviate the accusation of plagiarism of Mr. Howard. This has been denied, on the basis that "it was “ridiculous” to suggest the Conservatives were directed by George W. Bush and the Republicans or provided with talking points on Iraq." In any event, an individual speech writer has taken responsibility for the 2003 speech and stated: ""I apologize to all involved and have resigned my position from the Conservative campaign." On a lighter but trenchant note, never has there been a a better satirical exegesis of the issue of plagiarism than from Tom Lehrer, the 20th Century Mozart of satire, parody and perfect commentary of all things intellectual and political. Hear it here. BTW, one of my fav blogs has picked up on my campaign for a satire and parody right in Canada. See here on IPKat. The subject of copyright still remains apparently a non-issue at the leader level. Ensure that new copyright reform legislation fairly addresses compensation for artistic creators and includes proper input from all affected stakeholders including: arts/artist groups, educators, software innovators, consumer groups and ordinary Canadians. The Liberals don't even mention the subject, and their platform was never locked up. There's a lot of general criticism that there is so little discussion of actual issues going on. One would have thought that Bill C-61 would be a good issue to discuss, given the potentially severe consequences in terms of civil and criminal liability for Canadian individuals and businesses. There’s a big fluff over VANOC’s trade-mark application for WITH GLOWING HEARTS. See the Globe and Mail story, for which I was interviewed, here. Far be it from me to defend the overly zealous - indeed excessive - Vancouver Olympic IP effort, but actually, it was a "normal" trade-mark application. However, enough defence. The application does have an abnormally excessive and absurd list of wares and services, especially considering the nature of VANOC and what the Olympics is all about. As for taking of public domain phrases for use as a trade-mark, I don't see a problem in principle. If someone decided to sell cat food under the trade-mark RULE BRITANNIA, that might be silly from a business standpoint and self respecting cats might not eat it, it would be quite acceptable from a TM law standpoint. The other interesting aspect of this is that when the reporter called me late the other night, I asked if he had googled WITH GLOWING HEARTS. He had not and we did it on the spot. The first hit was this lovely website for a small business in Stratford, Ont. that sells woollen clothing and appears to have prior use of this trade-mark for clothing. Clothing. That could be a problem for VANOC. Fortunately, the little Stratford business, called WITH GLOWING HEARTS, and a URL with that same trade-mark has a very fine IP lawyer. So this could get very interesting. The Bush administration has stopped an attempt by the RIAA, MPAA and others to turn the US Department of Justice into a taxpayer funded civil litigation firm acting for the entertainment industry. The Bill almost got passed. It was opposed mainly by the EFF and the American Library Association. "I am happy to announce that after substantial discussions Chairman Leahy and the Senate Judiciary Committee have agreed to remove provisions from S.3325 that would have resulted in a massive gift of scarce federal resources to Hollywood and the recording industry. I regret that the legislation still includes provisions that overzealous federal prosecutors could misconstrue to allow the seizure of important components of our Internet infrastructure. I will work with Senator Leahy to clarify these provisions in the future. "I congratulate the committee on their strong efforts to improve enforcement of our anti-counterfeiting laws and hope those efforts will aid federal efforts to protect American producers and American jobs. "The removal of Title 1 from the original version of S.3325 eliminates a grant of federal power that was not asked for, or desired by the Justice Department. It would have had the effect of turning our federal law enforcement personnel into collections agents for industries that are more than able of taking care of themselves. The Justice Department has made clear that Title 1 would have resulted in the diversion of federal resources from important criminal actions into civil matters of questionable merit. "Unleashing federal prosecutors on Internet communications and discourse would also have a chilling effect on both commercial activity and free expression. Both the individual desire to share ideas and creativity more broadly and the drive of business to expand their markets and reach new customers have been the engines behind the most dynamic and vital new industry in American history. This is why it is so important that unintended consequences not be allowed to tax, throttle, or otherwise inhibit those creative forces. "With over 30,000 civil suits filed by a single entity against individual Americans it is clear that industry is more than able to enforce its intellectual property rights in civil courts without the contribution of taxpayer funds and busy federal prosecutors. I continue to urge the content industries to seek out distribution models that take into account, and profit from, the new technologies that have revolutionized the way Americans communicate, learn and share information. In a very important decision in the Jammie Thomas case, Judge Michael J. Davis, the Chief Judge of the U. S. District Court for the District of Minnesota has has granted Jammie Thomas a new trial. He held that he had erred in the notorious jury instruction #15 and that there is no "making available" right in the USA. There must be proof of actual dissemination. The Court ruled that the WIPO treaties are not self executing in the USA and the statute is not ambiguous. The Court would be remiss if it did not take this opportunity to implore Congress to amend the Copyright Act to address liability and damages in peerto‐peer network cases such as the one currently before this Court. The Court begins its analysis by recognizing the unique nature of this case. The defendant is an individual, a consumer. She is not a business. She sought no profit from her acts. The myriad of copyright cases cited by Plaintiffs and the Government, in which courts upheld large statutory damages awards far above the minimum, have limited relevance in this case. All of the cited cases involve corporate or business defendants and seek to deter future illegal commercial conduct. The parties point to no case in which large statutory damages were applied to a party who did not infringe in search of commercial gain. The statutory damages awarded against Thomas are not a deterrent against those who pirate music in order to profit. Thomas’s conduct was motivated by her desire to obtain the copyrighted music for her own use. The Court does not condone Thomas’s actions, but it would be a farce to say that a single mother’s acts of using Kazaa are the equivalent, for example, to the acts of global financial firms illegally infringing on copyrights in order to profit in the securities market. Cf. Lowry’s Reports, Inc. v. Legg Mason, Inc., 271 F. Supp. 2d 737, 741‐42 (D. Md. 2003) (describing defendants as a “global financial‐services firm” and a corporation that brokers securities). While the Court does not discount Plaintiffs’ claim that, cumulatively, illegal downloading has far‐reaching effects on their businesses, the damages awarded in this case are wholly disproportionate to the damages suffered by Plaintiffs. Thomas allegedly infringed on the copyrights of 24 songs ‐ the equivalent of approximately three CDs, costing less than $54, and yet the total damages awarded is $222,000 – more than five hundred times the cost of buying 24 separate CDs and more than four thousand times the cost of three CDs. While the Copyright Act was intended to permit statutory damages that are larger than the simple cost of the infringed works in order to make infringing a far less attractive alternative than legitimately purchasing the songs, surely damages that are more than one hundred times the cost of the works would serve as a sufficient deterrent. Thomas not only gained no profits from her alleged illegal activities, she sought no profits. Part of the justification for large statutory damages awards in copyright cases is to deter actors by ensuring that the possible penalty for infringing substantially outweighs the potential gain from infringing. In the case of commercial actors, the potential gain in revenues is enormous and enticing to potential infringers. In the case of individuals who infringe by using peer‐to‐peer networks, the potential gain from infringement is access to free music, not the possibility of hundreds of thousands – or even millions – of dollars in profits. This fact means that statutory damages awards of hundreds of thousands of dollars is certainly far greater than necessary to accomplish Congress’s goal of deterrence. It is worth noting that the RIAA brought in its lead litigator - the renowned Don Verrilli who won the Supreme Court Grokster case - to save this case. This attempt didn't work. Judge Davis is a brave and learned judge who on his own motion re-opened this case when he sensed that he may have made a "manifest error" in his jury instructions. Congrats to the intervenors including EFF, Public Knowledge and the professors whose research and advocacy turned this around. However, I doubt that this will be the end of the story. And one bit of potentially bad news for Ms. Thomas is that Judge Davis did rule that "distribution to an investigator, such as MediaSentry, can constitute unauthorized distribution". That ruling is bound to be controversial. Things are starting to get interesting in the Canadian election concerning copyright and culture. Jack Layton and the NDP are offering a $20,000 per annum copyright royalty income tax exemption. Ireland has long had a major provision exempting royalties earned by artists under specified circumstances. It seems that the Netherlands may have an even better deal, and the ever astute Bono and U2 have moved their music publishing activities to that jurisdiction. The current Government is coming under fire for cutting $45 million a year for the arts, which is a very controversial move generally and particularly in Quebec. See this video, if you haven't already, which also makes certain points about official bilingualism in Canada. New Zealand is now considering an explicit provision in its copyright legislation to allow for satire and parody. This follows a recent amendment in Australia. A fair dealing with a literary, dramatic, musical or artistic work, or with an adaptation of a literary, dramatic or musical work, does not constitute an infringement of the copyright in the work if it is for the purpose of parody or satire. The Gowers report in the UK recommended such an amendment. The US Supreme Court confirmed in the 1994 Acuff-Rose "Pretty Woman" case that a right of parody exists under the fair use provisions in American law. That leaves Canada alone without an actual satire or parody right or a willingness to seriously consider it amongst the major common law jurisdictions to which we normally compare ourselves. Even France, where copyright is taken very seriously, has such a right. It is understood that the main opposition to such a right comes from certain increasingly isolated voices in the Canadian music industry, who have managed to keep the issue off the table in the last two bills. How the denial of such a right could possibly hurt composers or music publishers is difficult to understand. There is no evidence that such a right has caused any harm in the USA in the 14 years since the Acuff-Rose decision. Indeed, the satire and parody genre has been indispensable to Western art and culture at least since the time of Aristophanes in Athens in the fifth century BC. I guess that things take a while to percolate through in Canada. The Supreme Court of Canada has ruled that it won't hear an appeal concerning the ringtones tariff. See my previous posting for what this was all about. I shall follow up with the possible implications of this ruling. As usual in these leave to appeal rulings, no reasons were given. Just when you think that things cannot get much crazier in the USA, they just have. The RIAA is now trying to sanction Ray Beckerman, a terrific lawyer in New York who has had the temerity to ably and courageously defend alleged file sharers, and to host and run an important, outstanding and richly informative blog and veritable database concerning RIAA's reign of terror litigation against some 30,000 children, dead grandmothers and perfectly ordinary folks in between. Here's the Wired Story. Here's the motion memorandum, in which there are several references to Ray's "anti-recording industry blog." It uses the word "vexatious" or "vexatiously" about twenty times. The RIAA must surely be shocked, shocked at the very thought that there could be "vexatious" tactics and proceedings in American courts. And speaking of absurd, the lead lawyer on the front of the memorandum in support of the motion, which is dated September 12, 2008 is none other than Richard Gabriel, former lead litigator the RIAA and who was appointed to the Colorado Court of Appeals on July 1, 2008. The redoubtable EFF has sued the secretive and determined USTR over its allegedly insufficient disclosure under the US Freedom of Information Act ("FOIA") concerning the very non-transparent ACTA negotiations. Here's the complaint. Here's the story from IP-Watch. According to this story, even corporate giants such as Google are concerned. Ironically, the level of transparency in Canada appears to even less than in the USA. In my experience with IP treaties, which goes back more than twenty years, draft texts have always been made public at a relatively early stage, even if replete with square brackets. Not so here. This treaty was supposed to be a done deal by the end of this year, although rumours are that this won't happen. We shall find out this Thursday, September 18, 2008 shortly after 9:45 AM whether the Supreme Court of Canada (hereinafter “the Supremes”) will hear an appeal concerning the Copyright Board's Ringtones Tariff payable to SOCAN. The main issue is whether the delivery of ringtones by a provider to the customer's telephone or to the customer's computer upon request constitutes a "communication to the public by telecommunication." While the narrow legal issues are highly technical, the ramifications entail the potential imposition of multiple layers of payment to multiple claimants for multiple rights involving the same activity and transaction. The concept of “double payment” could become “triple” or more. The “making available” right may some into play if the case is heard. The three dozen or so collectives in Canada and the oversight provided by the Copyright Board are supposed to simplify the legal landscape and reduce transaction costs so that creators can be paid more efficiently for their efforts and avoid market failures. Canada has more collectives and a larger full time Copyright Board with far more full time resources than any other comparable tribunal in any comparable country. So far, the result has been excellent for a small number of lawyers and consultants but is of questionable benefit overall to most actual creators, who have seen very little if any money from most of this adversarial and litigious activity. Since various governments have succeeded only in adding to this complex labyrinth, perhaps only a judicial commission can see beyond the box and sort out and simplify this morass. As matters stand, there are too many vested interests that benefit from the current state of uncertainty. Nothing in the last two Bills - the Liberal’s C-60 or the Conservatives Bill C-61, which both died with election calls, would have clarified this situation. In fact, Bill C-61 would have created the possibility of several new tariffs and the inevitable lengthy hearings and judicial review. If the Supremes hear this case and reverse the result below, there could be a significant domino effect on subsequent Board matters, including the seemingly perpetual SOCAN Tariff 22 hearing, which is now about thirteen years old and far from resolved. In fact, it is also under judicial review. Time for a Tariff 22 Bar Mitzvah? See my comments on the tie in between the Ringtones matter and Tariff 22 here. I should confess that I was involved in the Ringtones file at an early stage, but my client, a very major American supplier of ringtones with extensive knowledge of the market and issues, decided to withdraw, as have other major parties involved in Copyright Board hearings who might have brought useful evidence and insights to the table. I have blogged about the Board’s decision at length here, here and here. The CWTA lost its judicial review attempt in the Federal Court of Appeal on January 9, 2008, as reported here. The FCA apparently gave full consideration to the new argument reversing the CWTA’s previous concession, even though it was raised for the time only at the appellate stage. However, one cannot help but wonder whether a different record from below based upon the “no communication” theory might have helped the CWTA on its judicial review - or even have led to a different result at the Board. This file has already had a more than the usual twists and turns in the Supreme Court, with both sides attempting to strike out some or all of each another’s affidavit material. The Supremes have decided half a dozen major copyright cases since 2002. Before that, they heard about one every decade or so. Will they bite again this year? We’ll know soon enough. Here’s the Supremes’ summary of the case. Bill C-61 - Dead or Undead? Is Bill C-61 really "dead", now that an election has been called? Or is it really in the realm of "The Undead"? 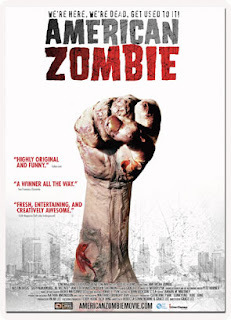 Since many believe that this bill was all about a "made worse in Canada" version of the American DMCA, is it fair to ask whether will it become a legislative real life version of that immortal thriller "American Zombie"? Love it or hate it, Bill C-61 will return, maybe even in a scarier remake. Maybe with a different number? Maybe as the "Son of 61"? For better or worse. Maybe sooner than you think! Copyright as an Election Issue? Gilles Duceppe, the Bloc Québécois leader, met with Prime Minister Harper on August 30. According to the CBC and the Montreal Gazette, copyright law is one of the short list of major issues on which there is disagreement. Abortion rights, copyright law and the approach to young offenders are also areas where the Bloc and the Conservatives don't see eye to eye, he [Duceppe] said. The lack of support for Bill C-61 by opposition parties may be one of the reasons why we are about to have an election. This reinforces the Don Martin story I posted about the other day. It is not known whether the Bloc's lack of enthusiasm for Bill C-61 is because it goes too far or doesn't go far enough.